Explore your passive side with Bit Pilot, an iOS game that looks a lot like a blend of Asteroids and Geometry Wars 2's Pacifist mode. Bit Pilot is an arcade shooter, minus the bullets, built on replayability and high score pursuits. The goal in Bit Pilot is to avoid a storm of asteroids both great and small as they stream across the iPhone and iPad's touch screen. Players can quickly steer their ship with a two-finger swipe of the fingers, or use a single touch for slower, more precise movement. Bit Pilot rewards players for simply enduring, outlasting their previous score via an ever-increasing score counter. Space pills occasionally sweep across the playfield, offering either bonus points or extra shields (making your ship a larger target, incidentally). Asteroids of increasing sizes eventually make the struggle to stay alive more difficult, and the description "Asteroids meets Canabalt," which I've heard more than once, seems most accurate. Did I mention that a deadly laser occasionally rips across the screen during games of Bit Pilot? Yeah. Watch out for that. New to Bit Pilot are two modes, Tunnels and Super Massive. The former fills the screen with huge asteroids, turning the game into a pixel-precise bullet hell-style game of death. 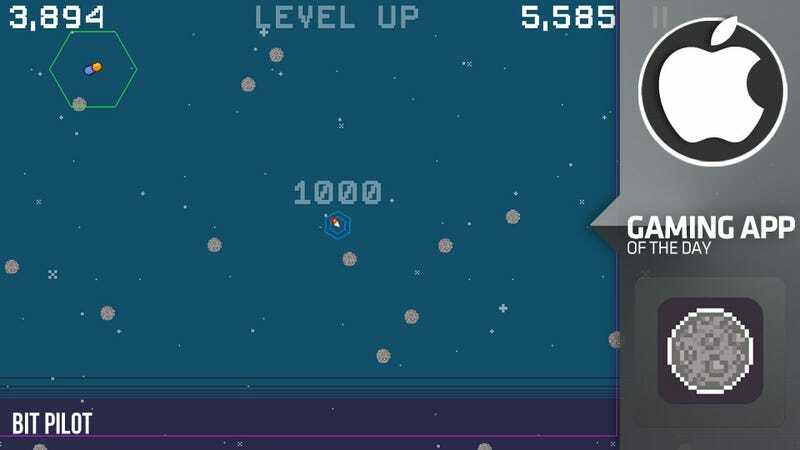 Super Massive does the inverse, flooding the playfield with the tiniest of asteroids, tossing copious power ups at the player. The most recent update also adds things like Game Center support, friends list score tracking, retina display visuals and more. Bit Pilot's simple but effective visual presentation is complemented by a solid, old-school (and unlockable) soundtrack by musician Sabrepulse, adding enjoyable authenticity to the overall package. Bit Pilot is available as a universal app for iPhone, iPod touch and iPad via iTunes for 99 cents.